Two Returns - Great For a Tuesday! 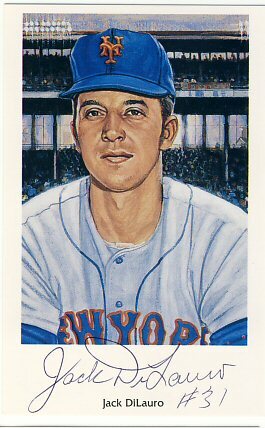 My son's Ron Lewis postcard collection is growing quickly. 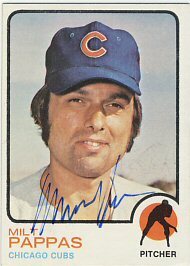 He has 12 of them signed now. He added five this past week. 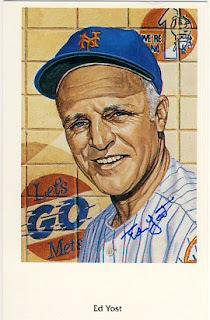 Ed Yost added his typical small signature. 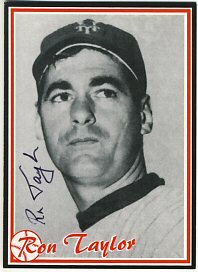 Ron Taylor signed his from Canada, included a signed card, and added a thank you and signature to David's letter. 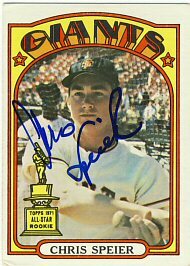 Jack DiLauro signed his added added is jersey number. 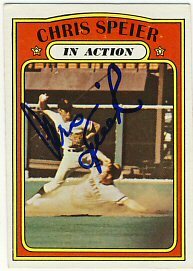 Bobby Pfeil's got a little smudged. 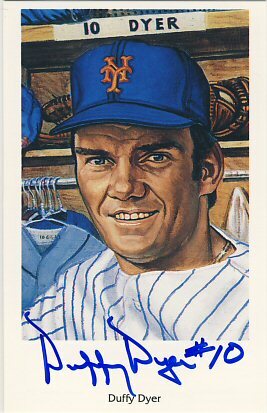 Finally, Ron Swoboda signed his for a $5 fee. I returned from my trip to find a few returns. 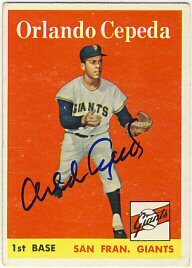 First, a received a couple of cards signed by Orlando Cepeda that an SCN contact took to a paid signing for me. 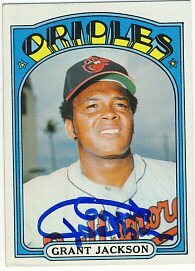 I got a 1972 Topps signed for my set and had a 1958 Topps signed for my older son. 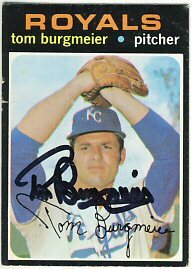 Tom Burgmeier signed four cards for my including a 1971, 1972, 1973 and 1978 Topps. 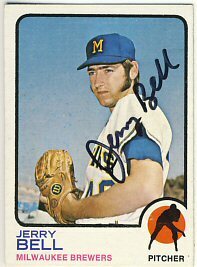 Jerry Bell signed his 1972 and 1973 Topps for me. 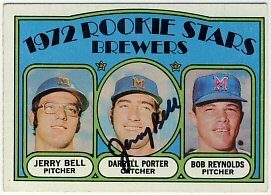 I thought at first that he signed the wrong picture on the 1972 Topps, but looking at his 1973 card, it looks like they switched the names on the pictures of him and Darrell Porter. 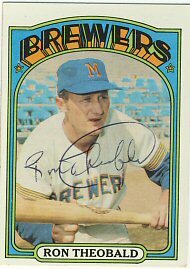 Ron Theobald signed his 1972 Topps. 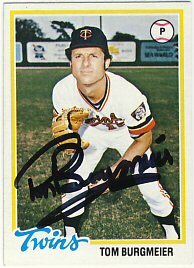 Finally, Jim Lonborg signed a 1972 and 1973 Topps. 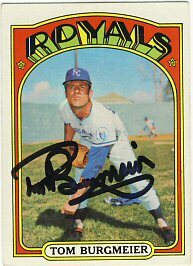 I've reached 80 different signed 1972 Topps, or 20% of my goal of 400. 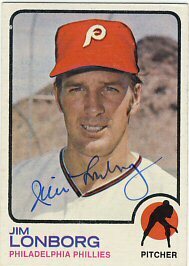 So far it's been easy. 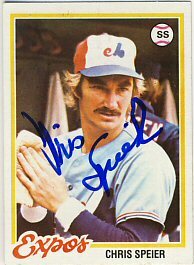 There are a few paid signings coming up for which I have to decide if I'm going to participate. 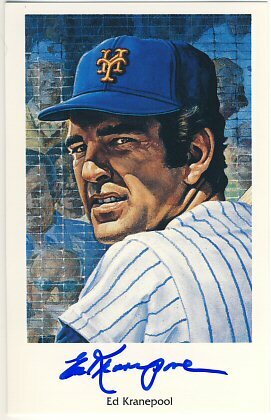 Yaz, Gaylord Perry, Jim Kaat. It all adds up! 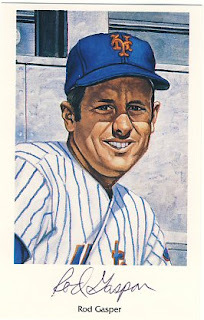 My younger son got back several Ron Lewis 1969 Mets postcards which I'll share tomorrow. Returns on Tuesdays are rare for me so I was happy to see two returns in my mailbox. 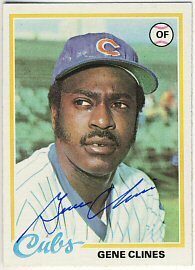 Cleon Jones signed both of his 1972 Topps for my set. 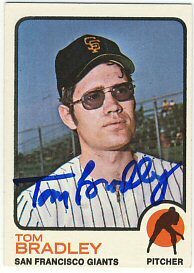 Tom Bradley signed his 1972 and 1973 Topps as well. I'll be out of town for a few days so hopefully I'll come home to a full mailbox on Friday. 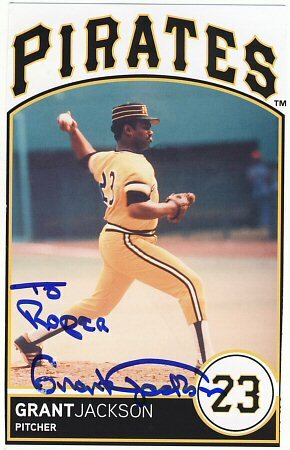 My younger son and I each received one return today. 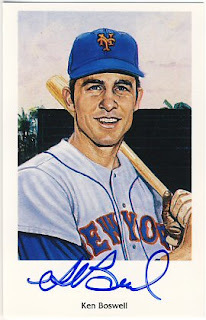 David received another Ron Lewis postcard, this time signed by Ken Boswell. We purchased some frames and Michael's for his postcards but it turns out they won't work because the mat openings are exactly the same size as the postcards. Anyone have any suggestions on an affordable way to display these? 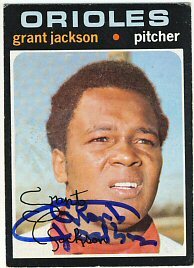 I received a nice return from Grant Jackson, who signed his 1971, 1972, 1973 and 1978 Topps. He also included a signed picture. 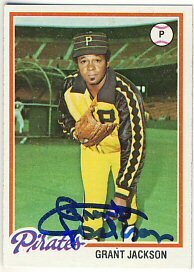 Wow, the Pirates sure had some nasty uniforms. I was out of town for most of the week and came home to only two returns and one failure. 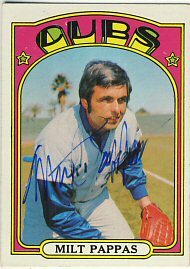 Milt Pappas signed a 1972 and 1973 Topps. 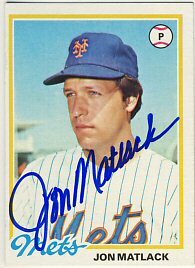 Jon Matlack signed his 1972, 1973 and 1978 Topps. 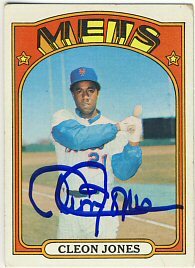 Cleon Jones returned my 1972 Topps unsigned with a note to contact Major League Alumni Services. 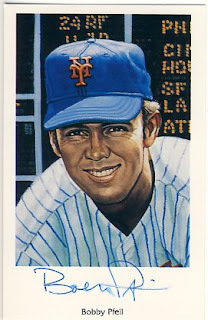 My younger son received two more Mets postcards: Jerry Koosman and Duffy Dyer. 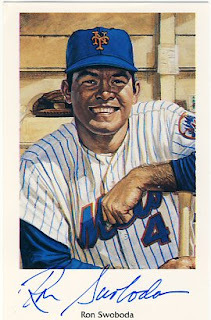 He's up to six of these postcards signed. 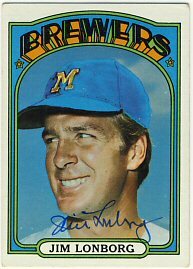 Both my sons got returns today, but I didn't get anything. 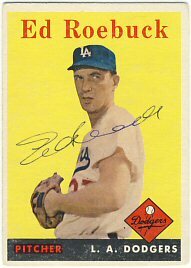 My older son received a 1958 Topps signed by Ed Roebuck. My younger son received four more postcards form the 1969 Mets set including Ed Kranepool, J.C. Martin and Rod Gaspar. 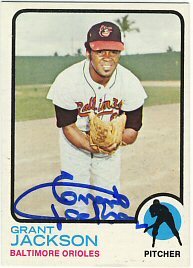 Gaspar's name is misspelled on his. That would be a bummer. 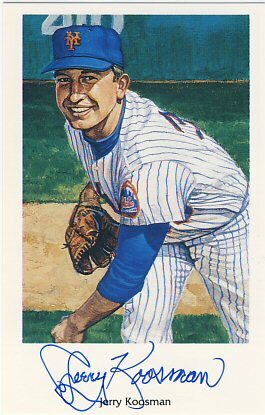 I sent out 13 more requests today, and my younger son sent out three more postcard requests. He's at the point now where the requests he has left to send charge a fee. 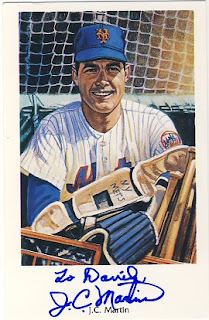 He's also decided to work on the Mets cards from the 1965 Topps set and has his list of those cards together. We used Sportscollectors.net to determine which of those players sign, so he has a good list of cards to buy at the next card show we go to. 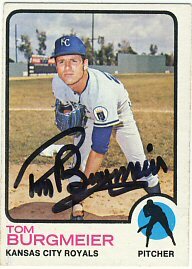 I entered a lottery for the opportunity to buy tickets for the ALCS had the Twins made it that far. I won the opportunity and purchased four tickets, wayyyyy up by the scoreboard, for $50 each. 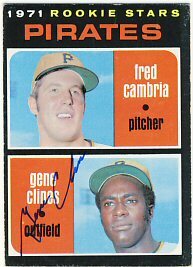 With "convenience fees" and other fees, it was more like $60 each. 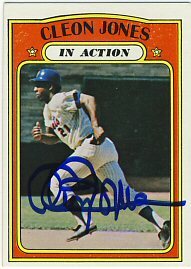 I received my tickets (and my credit card was charged), but of course the Twins were swept again by the Yankees. 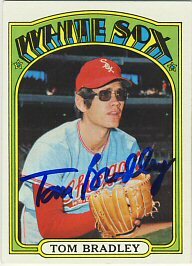 I'm left with these tickets as a reminder of the Twins early exit from the post season. 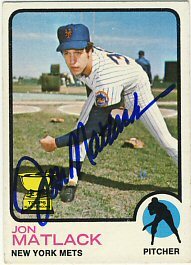 My younger son became a Mets fan the day they signed Johan Santana. He recently has become a little more interested in getting some autographs through the mail so I bought him the Ron Lewis 1969 Mets postcard set. He's sent out about a dozen so far and today he got back his first return. 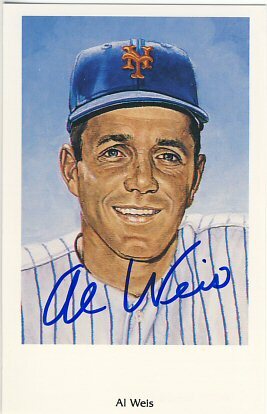 Al Weis signed his postcard in only four days. 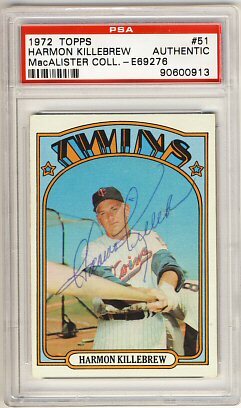 I bought a signed and authenticated Harmon Killebrew 1972 Topps on eBay for less than his signing fee at TwinsFest, which seemed like a bargain to me. I had bought another one for the same as his signing fee, and gave that one to my older son. Today I mailed off my 1972 Topps Billy Martin and Willie Mays cards to PSA/DNA for authentication. 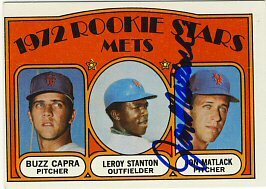 The shipping, both there and back is a killer, so if I use this service again, I'll group it into a lot of more cards to help spread the cost. I received a couple of returns today. 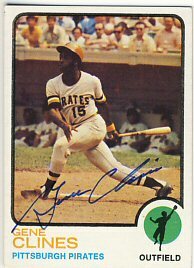 Gene Clines signed his 1971, 1972, 1973 and 1978 Topps. 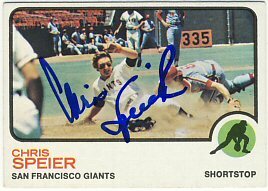 Also, Chris Speier signed his 1972, 1972ia, 1973 and 1978 Topps for me. 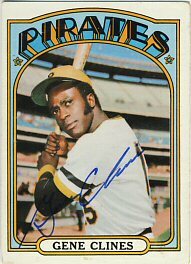 I am falling behind sending out requests. Hopefully I can get 10-15 done this weekend to mail out on Monday. 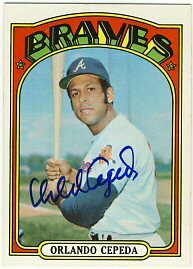 No ttm requests back today, but I did receive a few cards back from signings put on by Chris Potter Sports, as well as an Ebay purchase. 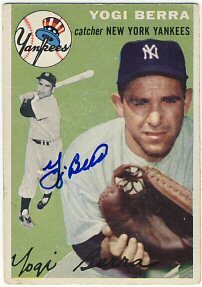 I got three cards back from Chris Potter today, the best of which is a 1954 Topps signed by Yogi Berra. 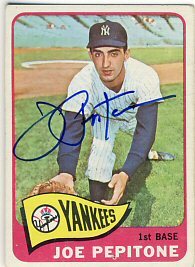 I also got back a 1965 Topps signed by Joe Pepitone, as well as one signed by Jack Fisher. 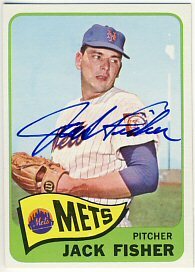 I'm not sure why I sent in the Jack Fisher, as I already have one signed by him. I guess my collection is getting too big for me to keep track of. 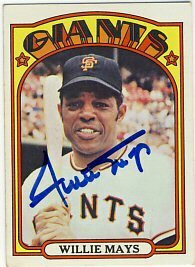 I bought a 1972 Topps signed by Willie Mays on Ebay. 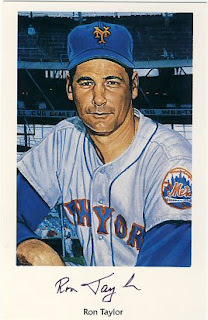 I'm sending this as well as the Billy Martin I bought a few days ago into PSA/DNA for authentication and encapsulation. It's a confusing process and hopefully, once I get it figured out, I'll post the process on this blog.